March Madness is screaming for its own version of tailgate food. What a better answer then some balls! Let’s face it; wings go with sports, all sports, they’re almost a food group. It’s a rite of passage, watch a game and eat wings (and of course drink beer). As with all superior food groups, chefs strive for reinterpretations and tributes to the pedestaled dish. These are surely a way to a man’s heart, and completely loved by the fussy woman that dislikes gnawing on bones. I do have a few girl friends that hate wings because of the tiny veins found in bones and detest the dirty finger result of eating wings. 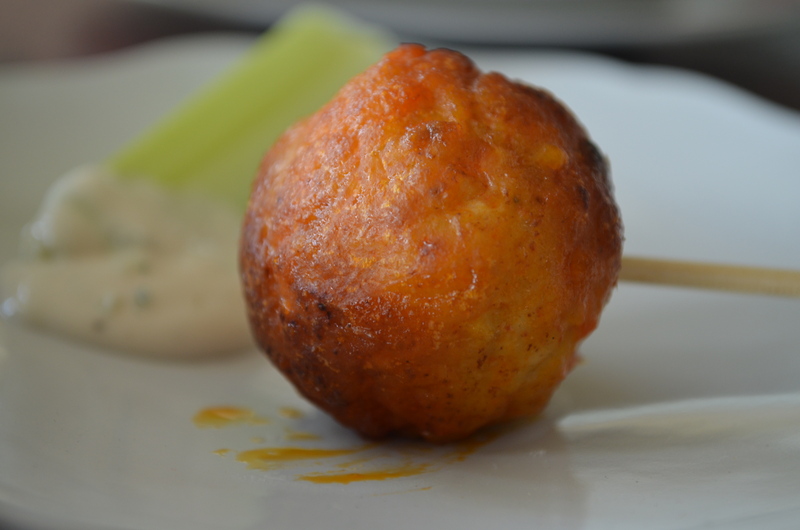 My answer- Buffalo Chicken Meatballs. Combine ground chicken, seasoning, salt, egg and breadcrumbs thoroughly. Place the mixture in the freezer for a few minutes so the mix becomes easier to work with. Use a small scoop to make between 14- 16 balls, the size of a ping pong ball and place on a cookie sheet. With the back of the scoop or a tip of a spoon form a well in each ball. 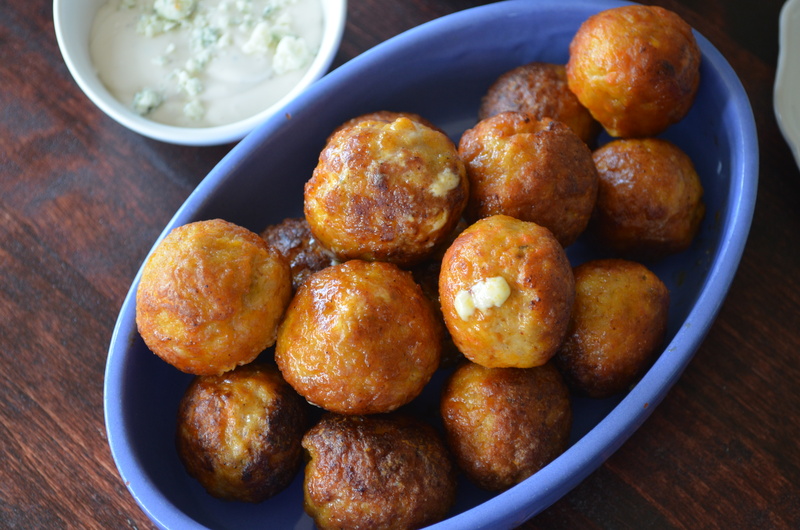 Fill the wells with roughly a ¼ teaspoon of blue cheese. Drink your beer. 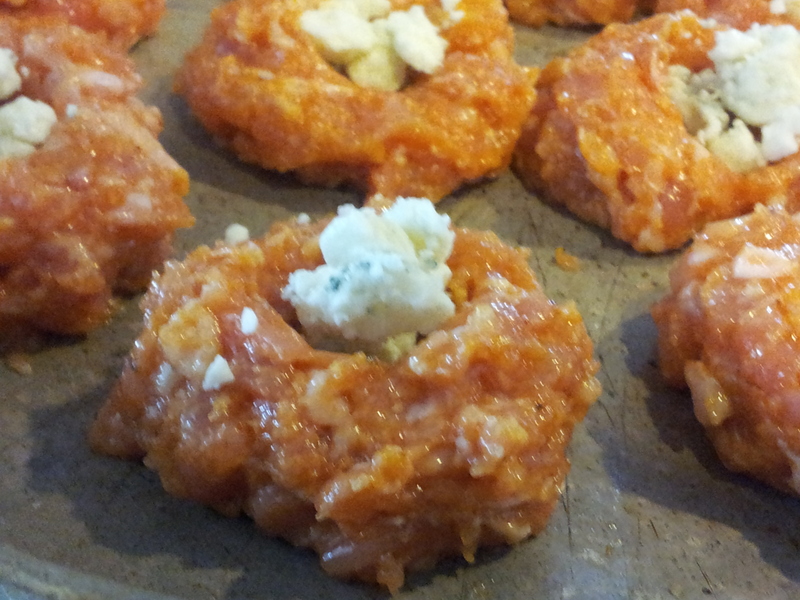 Gently reform the chicken into a rounded sphere, focusing on keeping the blue cheese in the center. Return the balls to the freezer for about 15 minutes to set the shape. Preheat the oven to 350. Combine the seasoned flour ingredients in a small bowl and place a sauté pan on the stove over medium high heat. 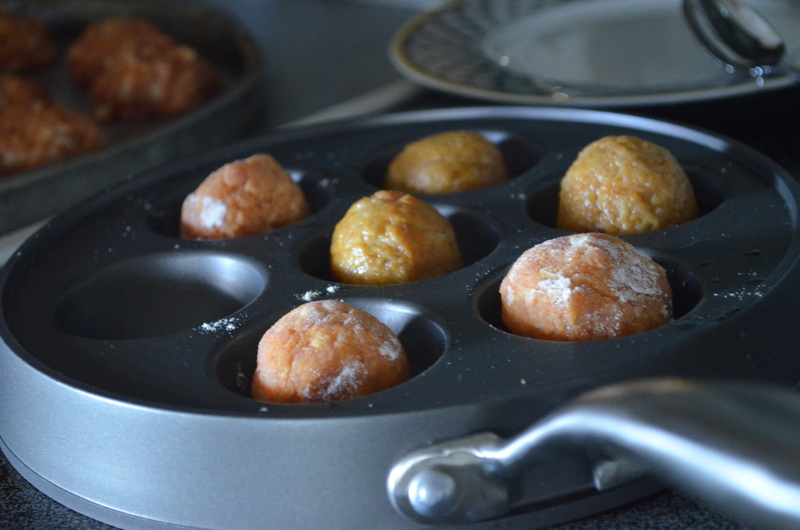 If you have an Aebleskiver pan use this- I love using mine for meatballs as it gives a beautiful sear all around the meatball. Take a sip of beer. 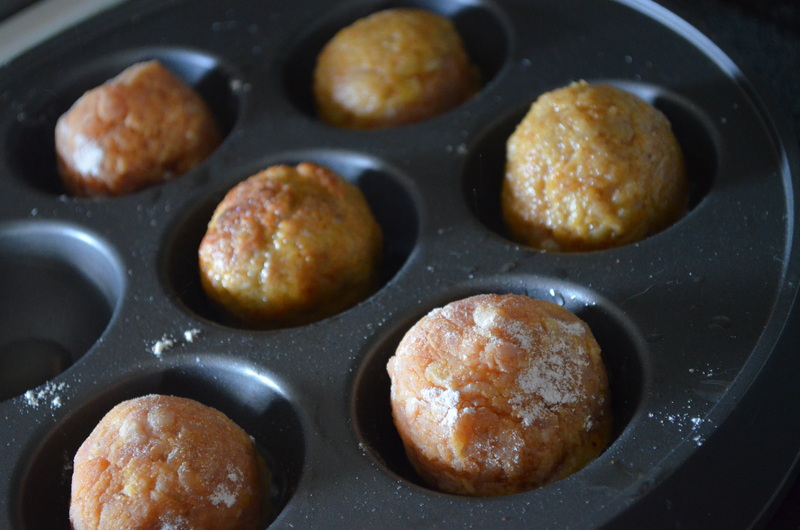 Add a tablespoon of oil to the sauté pan, or a few drops of oil to the Aebleskiver wells, while oil heats roll the meatballs in the seasoned flour coating them completely. Place the balls in a hot pan and sear the meatballs evenly until the outside is well browned. Swig your beer. In another small bowl put 2 tablespoons of buffalo sauce. Remove the meatballs from the sauté pan and place into the buffalo sauce, rolling them around to coat evenly. Place the balls on a baking sheet and pop into the oven for 10-12 minutes until the internal temperature reaches 165 degrees. Remove from oven and serve. This makes enough for 2-5 friends, depending upon the size of the appetite and the other dishes on the table! 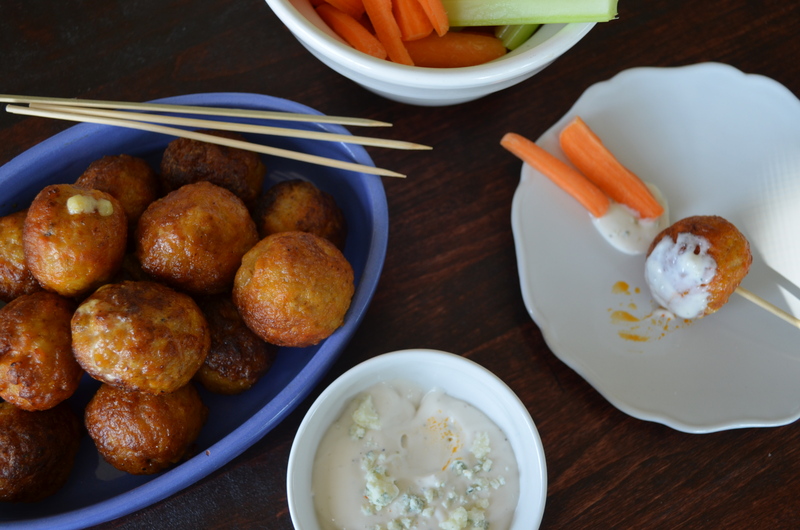 Serve with blue cheese dressing, ranch, celery, carrots or whatever you love with wings (beer). 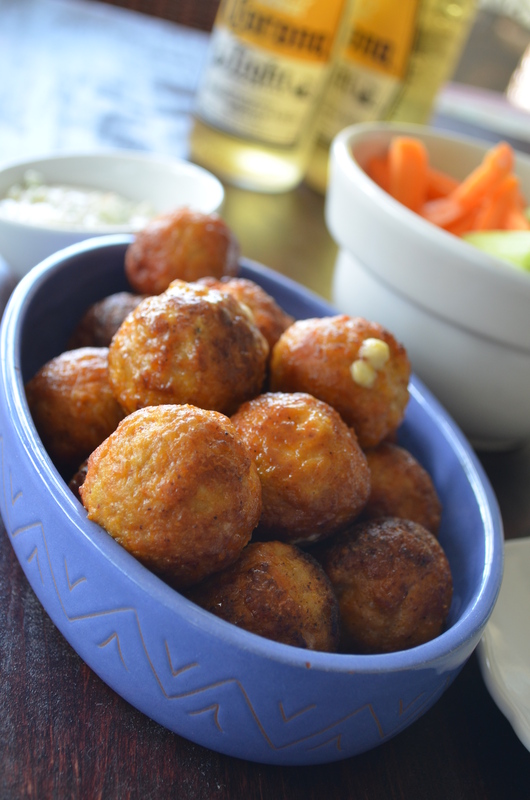 March Madness, Buffalo Chicken Balls, Clean Fingers, Happy Wife and Beer- Husbands delight!! Happy St. Patricks Day, and Happy Selection Sunday- GO ACC & SEC!!!!!! 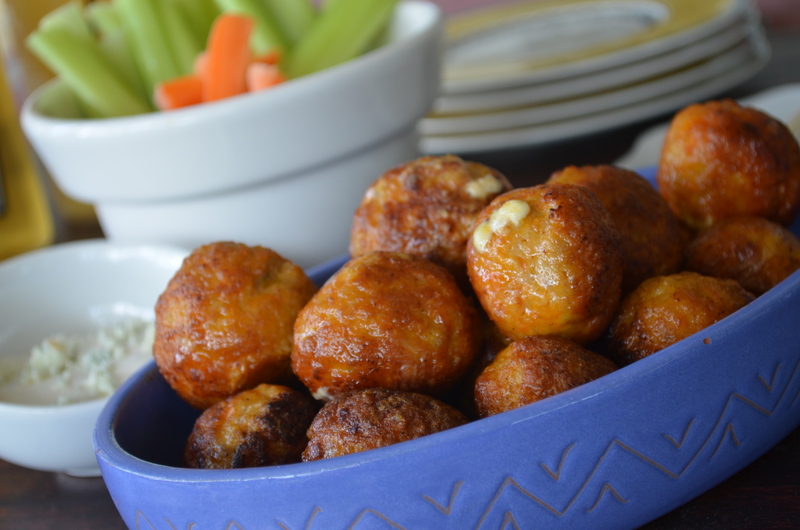 This entry was posted in chicken, Fun Food, Game Day Food, Recipes and tagged Buffalo Chicken, March Madness Food, Meatballs. Bookmark the permalink. Dang! I had all of the ingredients but the beer, and since it seemed so essential to the recipe, I’ll have to wait until another day.